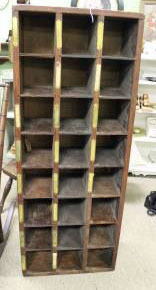 Vintage Mail Sorter Box – Revived – Uniquely Yours… or Mine! OK…. so here I go again without a before picture, well technically I have the one from the Craig’s List listing, but it’s not very good.. I’m going to insert it anyway! 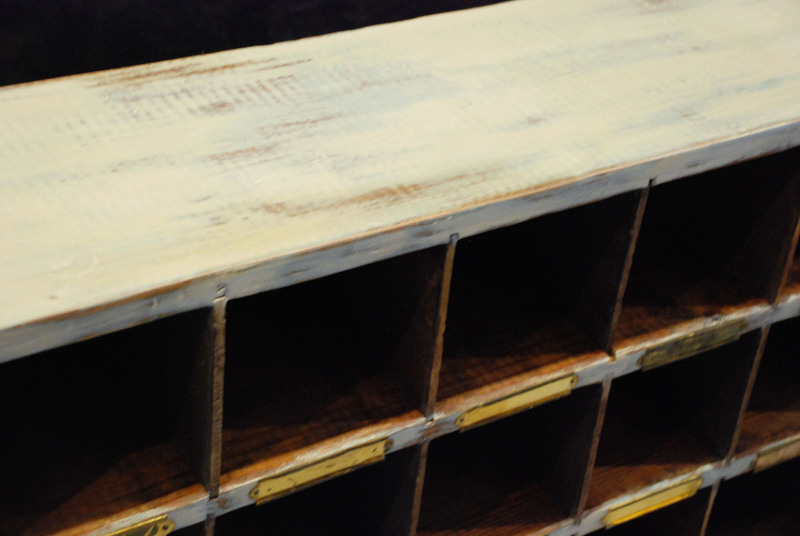 Here it is in all it’s glory… a vintage wooden mail sorter, it has 24 cubbies & 20 of the original brass name plates. The back of the piece had some damage and the wood itself had a lot of nail holes and nails sticking out of it, but it was COOL!! I was waiting for my husband (“furniture moving man”) to meet me at the store, so I took the tag off of the piece (yeah.. of course so no one else could snag it!) and took it down to the register. I usually just hold on to a tag until I’m done but for some reason I decided to drop it off with the cashier as I continued to look around… now let me tell you about 2 minutes after I walked away the cashier received a phone call from someone who saw this on CL and wanted to buy it… Um.. well of course she told her I had just given her the tag.. you snooze you loose! For some reason it is always more exciting for me when I buy an item that I know someone else wanted too.. that sounds bad doesn’t it? I would be awful in one of those free-for-all brides dress sales… I think I would be one of those ladies you see sitting on top of a huge pile of dresses regardless of whether they fit her or not (what’s up with that?).. seriously laughing now just thinking about it.. Anyway I digress.. Cool piece, needed some work, right up my alley.. here we go! Let me start by saying I knew I was not going to keep this piece. I didn’t really want to paint it but the outer wood case was so rough and with all of the nail holes I just felt like it may have been too rustic.. So my handy, dandy husband cut a new 1/4 wood back that I stained and reattached. I removed what nails needed to come out, removed the brass name plates (keeping original nails) and filled in the large holes but left normal wear and tear gauges. After a bit of sanding (thanks goodness for this unseasonably warm weather around here) she was ready to paint. I used AS Chalk paint in Duck Egg as the base color and then a light top layer of ASCP in Country Grey, only painting the outer cabinet and the front horizontal face pieces. Since it had gotten cool again I took the piece inside to finish up. I used water and a sponge with a scouring pad on one side to do the distressing. Now I don’t normally distress this way, but it works very well and honestly I just hate the chalk paint dust! It doesn’t work for all pieces, but this one had such light layers that it worked very well. The sorter got a coat of wax and a good buffing.. now I use 0000 steel wool to do my buffing…I love it and I think it works great! I do a final wipe down / buff with a soft cloth and that part is done. I then added back the plates so that the missing plates were at the bottom row rather than scattered about. I cleaned out the inside of the cubbies with Murphy’s Oil soap spray (love the smell of this stuff) and called it complete! I love the way it turned out! I think the finish looks authentically old even if it isn’t! 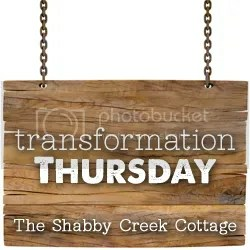 I think it would look great hanging on the wall (you would need to add a cleat) or even sitting on the mantle (it’s only 8″ deep)… so many great uses for this… what would you do with it? Previous Post: This one is a keeper.. I think.. It would be great in a mud room – for all those things that get lost – labels on the cubbies – gloves, mittens, shoes – even those short umbrellas. that is awesome! what a great find!!!! Thanks Jen! 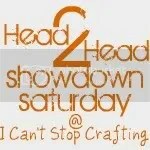 Stopped by and posted it on your blog! I love your piece and the way it turned out. The layered ASCP is a beautiful finish and your distressing is perfect. I’m happy to see how you handled the mail slots, as I have a piece (you can see it here http://onceuponafirefly.blogspot.com/2011/12/thank-you-and-call-me-crazy.html) that was a mail station in an old hotel. I’ve been fretting about whether it would look okay just to paint the shell, as painting all those mail slots would be . . . well you know. And, the slots on my piece are very small compared to yours. Thanks a million for posting your fabulous redo. Gives me hope for mine.